Johanna Skibsrud was born in Nova Scotia, Canada in 1980. Her debut novel, The Sentimentalists, was awarded the 2010 Scotiabank Giller Prize, making her the youngest writer to ever win Canada’s most prestigious literary prize. 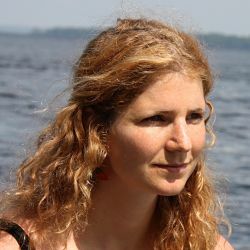 Johanna received her BA in English Literature at the University of Toronto, her MA in English and Creative Writing from Concordia University in Montreal, and her PhD in English Literature at the Université de Montréal. She is currently an Assistant Professor of English at the University of Arizona. The Description of the World was the original title for Marco Polo's writings about his travels, but in describing the world, Polo also helped to create it. In this collection, Skibsrud asks: is our world really what it appears to be? How do we shape it through language? And if language can create our world, can it also transform or destroy it? At every turn, this rich and ambitious novel tells some of the less well-known stories of twentieth-century history with epic scope and astonishing power, revealing at every turn the ways in which history and memory tend to follow us, and in which absence has a palpable presence." In the Scotiabank Giller Prize winning author Johanna Skibsrud's new book, nine loosely connected and hypnotic stories introduce an unforgettable cast of characters. A young maid at a hotel in France encounters a man who asks to paint her portrait, only later discovering that the man is someone other than who she thinks. A divorced father, fearing estrangement from his thirteen-year-old daughter, allows her to take the wheel of his car, realizing too late that he s made a grave mistake. A Canadian girl and her French host stumble on the one story that transcends their language barrier. Youth confronted with the mutterings of old age, restlessness bounded by the muddy confines of a backyard garden, callow hope coming up against the exigencies of everyday life these are life-defining moments that weave throughout the everyday lives of the remarkable characters in this book. Time and again they find themselves confronted with what they didn't know they didn't know, at the exact point of intersection between impossibility and desire. In This Will Be Difficult to Explain Skibsrud has created a series of masterful, perceptive tales." Haunted by the vivid horrors of the Vietnam War, exhausted from years spent battling his memories, Napoleon Haskell retreats to a small Ontario town. When Napoleon's daughter arrives, fleeing troubles of her own, she finds her father in the dark twilight of his life, and rapidly slipping into senility. With love and insatiable curiosity, she devotes herself to learning the truth about his life; and through the fog, his past begins to emerge.